It is time to bid farewell to Australia. 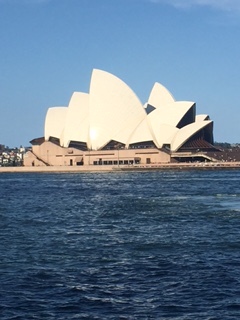 I truly had the most amazing time in Sydney & I know I would be really happy living here. I’m ready to get on the road again & be captivated by Bali. I’ve had a busy day of last minute booking, shopping, organising & farewelling. True to form I arranged a consultation regarding my travel vaccinations the day before leaving Sydney. I went to the International Travel Vaccine Centre hoping I already had most of the required vaccinations. Four injections, boxes of Malaria tablets, a cholera cocktail & $500 later I am feeling pretty sorry for myself. (I think $75 of this was the consultation fee which I wasn’t initially aware of *grumpy face*). I thanked the nurse & she said it was ‘her pleasure’…. Charming! My friend has kindly agreed to stowe a bag of my belongings for the foreseeable future for me. I am so relieved, my back rejoices! This is obviously an unwritten contract that I shall have to return to collect them. ‘Present me’ is so laid back about the future & ‘future me’ will be so mad I’ve made a snap decision & will need to make an extra journey to Sydney for a bag of shite (it’s not really shite) (it’s kind of shite) (some of it)…. My manipulative unconscious, however, has just formed a ‘compulsory’ return to Sydney which is a pretty awesome plan. Right?! In true me style I booked my accommodation & arranged my airport transfer less than 12 hours before my arrival. I am always too absorbed in my current activity & surroundings to organise my next step. I always live on the cusp of disarray & unpredictability. Sometimes fun, sometimes a logistical nightmare! I have also booked a flight to India for two weeks later! I’m so excited to have the plans in motion for a country that has featured on my list for so long! With a sad heart & a heavy regret that I never applied for a working holiday visa, I bid Australia farewell. I have a big love for koalas. They are my spirit animal. My friends carefully selected this as my spirit animal as nothing else remotely rhymes with my name & this was the best they could come up with. In hindsight this has been an excellent & apt selection on their part. I feel like anatomically I have similar characteristics to koalas & even our behaviour can be likened. I even save pictures of koalas that I feel embody me. Is that a step too far into my tangled mind?? Upon booking my flight to Australia I was overcome with a second wave of excitement at having the opportunity to finally meet a koala (under respectful cruelty free conditions of course). My pal already knew of my resolute dedication to koalas so she arranged a trip for us to go to Symbio Wildlife Park to see the koala bears. Even the chocolate bars are koalas! I was so excited when we arrived. I couldn’t stop smiling & was breaking my neck to try & spy the koalas up ahead. Yes, I was embarrassing. When we got to the koala area I was fascinated to see them & I won’t hesitate to tell you it felt like a reunion with a long lost family member. I can’t confirm whether the feeling was mutual, but I certainly had a deep unwavering love for the koalas. My good friend & her boyfriend politely put up with my childlike enthusiasm & again I felt so lucky to have friends who put up with me! We stayed for the koala talk which was, of course, extremely fascinating & bonded me more to my spirit animal. Afterwards they were doing photo’s with the koala’s for $20 so I literally jumped at the chance to meet them & gently stroke their soft inviting fur. I wanted to nuzzle my face into their fur & ever so slowly motorboat action them – in the most sweetest animal loving way. Unfortunately it would just be a picture next to them as cuddling koalas is banned in New South Wales & I support anything that protects animals (although I am in a zoo…..). When I got into the koala enclosure I felt so excited to meet them! My friend said I immediately told the park keeper that koalas were my favourite animal, like a 3 year old might. Sometimes I wonder how I can be this person one moment & a fully functioning adult with adult responsibilities the next. There were two koalas in the enclosure but I had my eyes on Imogen – the one the park keeper had during her talk. She seemed to be curious with a bit of attitude & really fluffy! As I approached her she fled to the highest branch of the tallest tree. Was it my manic smile?? I swear I was coming with only love for her! The park keeper & assistant lured her down with food & took her to another tree where she again tried to flee from my loving energy. Maybe this is what I do to men (that I’m interested in). The staff considered getting the other koala then the photographer started snapping us & assured me that he got the picture. I was disappointed not to get a cuddle – or keep her forever. So this is the tale of the day I met & was publicly SHUNNED by my spirit animal. The awkward thing is that I respect her attitude & still love her & will continue to be spiritually linked to koalas. My eating tour continues… Today we went for a drive to Manly & went to Four Pines for lunch. Dear God it was incredible!!!! I seem to be really splashing out when it comes to food & drink in Australia – not something I would allow myself to do so much in New Zealand. The food is amazing here & there is so much choice! In Four Pines I shared a salad & the vegetarian platter washed down with alcoholic ginger beer. Easily the best meal I’ve had this year!!! I did my signature classic eat-so-slow-to-bask-in-every-bite move. We were there for a few hours eating, chatting & putting the world to rights. Life is so good! Even the 3 hour journey home via Sydney traffic couldn’t dampen my spirits. My friend (who has joined uber as a driver) even managed to pull in behind a line of parked cars presuming it was traffic (They were clearly parked cars) – this is the second funniest thing that I have witnessed this year! The first of course was dearest Julia & her failed bungy jump in Queenstown. I am still showing people that video, I will never tire of it. Today I met up with another good friend. It is so surreal seeing someone again after so long! We went for a lovely wander around Botanic gardens catching up then walked to the Sydney Opera House & had a couple of glasses of wine & a cheeseboard while taking in the view of the Harbour Bridge. It was so perfect! I really feel blessed at times. The volunteers heroically open the baths at 6am so ladies can take advantage of a pre work morning swim. My mind was instantly saturated with ideas of me living in Coogee, getting up for a swim before work & enjoying the good life. Really Australia, can I stay?? Who knew I would fall head over heels for Australia!?? Australia has always been somewhere I didn’t give much consideration. I presumed it would be unbearably hot for me with too many spiders for me to cope with. With everyone going there I always knew it would be incredible, but maybe not for me…. I have since fallen in love with Australia – based purely on my love for Coogee. It is incredibly beautiful, my friends here are so happy & have a wonderful lifestyle. The pace of life is perfect. The area is absolutely stunning & it seems very sociable. What’s not to love!!?? Along with the better wage in comparison to New Zealand I feel Australia may be a more financially viable choice for a working holiday (with intentions to save). I did the walk from Coogee to Bondi which took over an hour with all my stops to bask at view points & take photographs. I went to world famous Icebergs for a glass of delicious Pinot Grigio & enjoyed the laid back fun atmosphere. Bondi beach was not as bogan as I expected! Everyone along the coastline seemed super chilled really appreciating their surroundings & making the most of it. I have a strong desire to be one of those people! I took the bus into town & enjoyed the familiar shops & busy, self important pace of life. I went back to my friends, got a bottle of wine to have with dinner & ate tacos, drank, gossiped & laughed. What a perfect day. Australia, can I stay??? 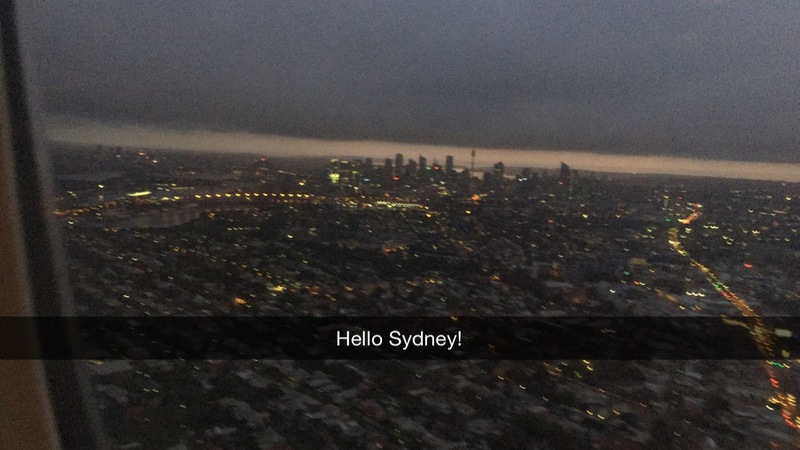 Flying into Sydney on the cusp of sunrise & the skyline looks incredible. I have a feeling I would have a good time in this city. It’s a shame I’m just here for a connecting flight. I’m exhausted from the traveling. I hate how my face feels so congested & puffy & my feet feel heavy with fluid. I hate how my skin is as dry as the Sahara & my eyes are crinkled with lack of sleep. Despite all these things I still do it & will continue to for the feeling of a new country, for the air of somewhere new & the atmosphere of the unknown. You will not break me jet lag. You won’t even deter me slightly. I will endure you. Wanderlust has me now.